In the spirit of the currently occurring and upcoming Holidays, Nintendo has seen fit to give us absolutely nothing extra this week. The three games released this week really aren’t that eye catching unless you’re looking forward to playing more Phantasy Star or another simple sports or puzzle game. Phantasy Star IV (SEGA GENESIS, 1 player, Rated E for Everyone-Fantasy Violence, Mild Sexual Themes, 800 Wii Points) hits WiiWare and Tiki Towers (RealArcade, 1 -2 players, Rated E for Everyone-Comic Mischief, 500 Wii Points) and Fun! Fun! 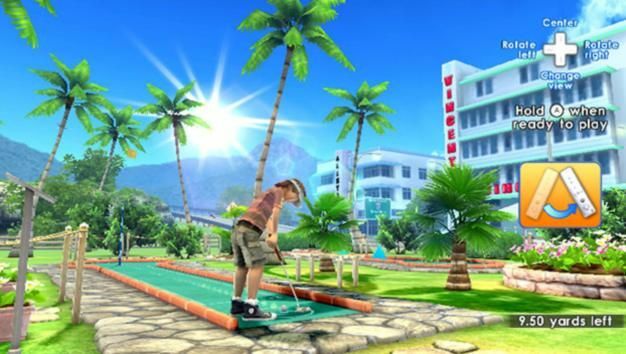 Minigolf (Shin’en Multimedia, 1-4 players, Rated E for Everyone, 900 Wii Points) come to the VC and in a cloud of non-good-last-minute-gift cheer. While I will never be against Phantasy Star games, there is a whole other host of games I would have rather seen as Nintendo’s Christmas present to all us loyal fans. I know the VC has been around a while but there are still hundreds of in demand games that would have been better than Phantasy Star IV. In fairness, Tiki Towers could be a devilishly challenging puzzle game involving construction, destruction and monkeys, but I’m just kind of tired of this level of game on WiiWare. Why do we have to sit through multiple weeks of nothing to get a World of Goo or a Strong Bad game? Same goes for Minigolf up there. If there is a genre that has been played out on WiiWare and the Wii in general, it’s motion controlled sports.